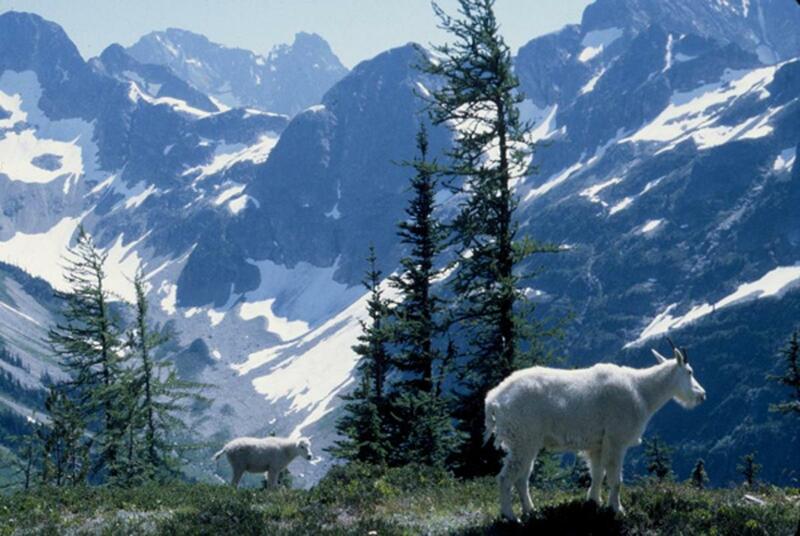 Mountain goats stand beside the Easy Pass trail in North Cascades National Park. Correspondent Tom Banse reports on the upcoming 50th anniversary of Washington's North Cascades National Park. North Cascades National Park turns 50 years old next month (Oct. 2, to be precise). It took skillful political compromise in the 1960s to establish the new national park and the adjacent Ross Lake and Lake Chelan National Recreation Areas. The next fifty years for the park complex may need more skillful stewardship. The North Cascades park and its friends are celebrating the big 5-oh from August to October. There was "Cascades karaoke" at the park visitor center last month, artists in residence, a history town hall. A mountain climber is trying to scale 50 peaks in the park for the fiftieth anniversary. Coming up, the park gets more love at a harvest festival in Stehekin (Oct. 5-7) and a mid-October party in Seattle (Oct. 14). About the people who pushed for the park: a political legend, U.S. Senator (Henry) "Scoop" Jackson. The first paid environmental lobbyist in the U.S. got his start pushing for a North Cascades National Park (that was Mike McCloskey of Portland, who later became director of the Sierra Club). Author Lauren Danner says activism in the 1950s and '60s to establish a national park "jump started the modern environmental movement in the Pacific Northwest." Danner says virtually the same arguments are being heard today with Bear's Ear and Grand Staircase-Escalante monument debates. The land was managed before by the U.S. Forest Service. "It's always in the (lists of) national parks you should see that you don't know about," Danner said. "It is hugely important in what its creation meant for the modern environmental movement, because it helped that movement get off the ground." Danner wrote in a recently-published park history titled "Crown Jewel Wilderness" about how logging, tourism, bureaucratic and conservation interests were reconciled. "What happened in the North Cascades I think was a masterful political compromise. No one was totally satisfied," Danner said. "People today still want Mount Baker in the park, right? 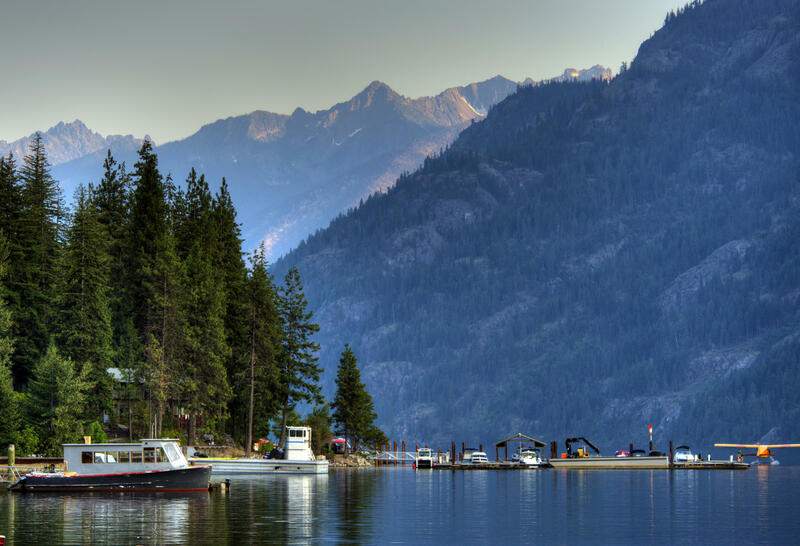 Some people want Stehekin out of the park. But everyone got a little of something of what they wanted. And when you look at a map that is what you see. It looks like a patchwork quilt." A mishmash of dotted lines and color shades with different levels of protection. There are two pieces of true national park, split by a national recreation area with three dams, bracketed by another national recreation area, next to national forest wilderness and an international border. It's "a complex complex," says current Park Superintendent Karen Taylor-Goodrich. She says the next 50 years might be dominated by facets of the same issue she's wrestled with for the past five since she took over as superintendent. "First and foremost, it's really adaptation," she said. To a warming climate and changing population. Taylor-Goodrich says melting of the park's many glaciers affects water supply. Plus, there are more wildfires burning more broadly. She may need to bring on seasonal rangers earlier for a longer visitor season. The park is normally snowbound for half the year. "We have different maintenance challenges with more spring flooding. So we're having to be more reactive right now as we adapt in a number of different ways," Taylor-Goodrich said. This year, the three units of the North Cascades National Park complex could hit one million total visitors for the first time, although wildfire smoke in August may have kept enough tourists away to cause the tally to fall just short. The park does not charge an entrance fee unlike other Northwest national parks such as Mount Rainier and Crater Lake.